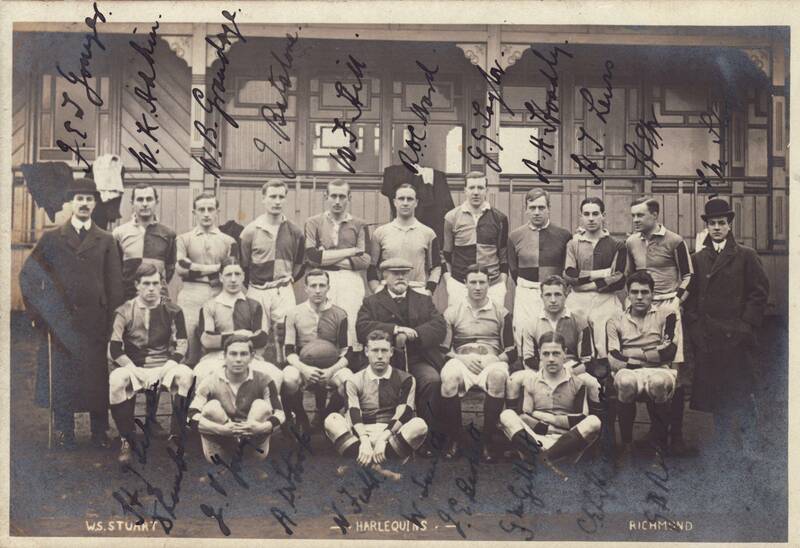 Manly Oval in 1903... an old postcard sent from Sydney to Italy... Not related to rugby, but nice picture anyway ! Whilst it has never been a major sport in the country, Rugby Football has a long history in Canada. According to Rugby Canada (cf "History of Rugby Canada"), the first game of rugby recorded took place in Montreal among artillery men in 1864. That same year, Trinity College in Toronto (err... I don't have this exact picture... above is Upper Canada College in Toronto instead !! ), published the first set of rules for the game of rugby in Canada. 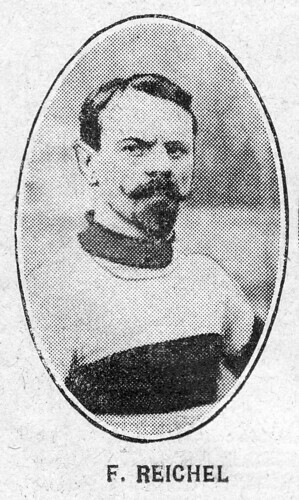 In 1868, the first club, the Montreal Football Club was formed. 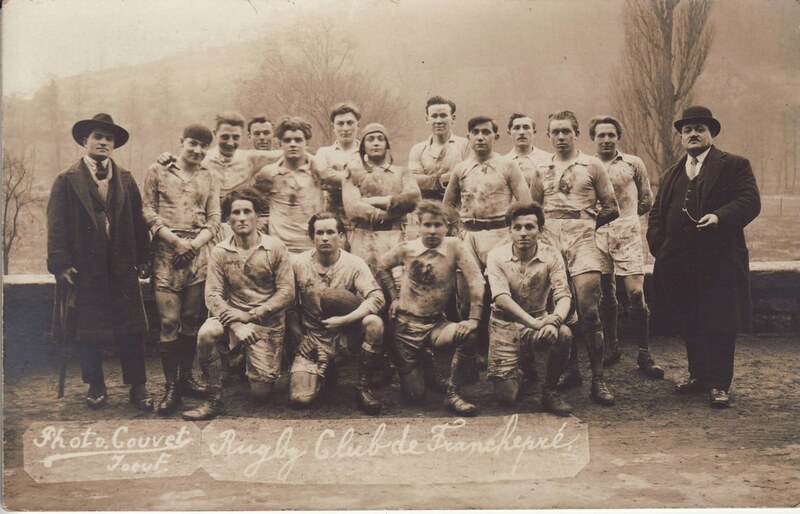 Quoting Rugby Canada again: "Across Canada, there was a brief pre-war resurgence of rugby, [...] From 1914 to 1919, only in British Columbia and Nova Scotia, were there sufficient numbers of teams to arrange matches on a semi-regular basis. [...] In 1919, a Canadian Services Team played overseas against representatives from England, New Zealand, South Africa and Australia. 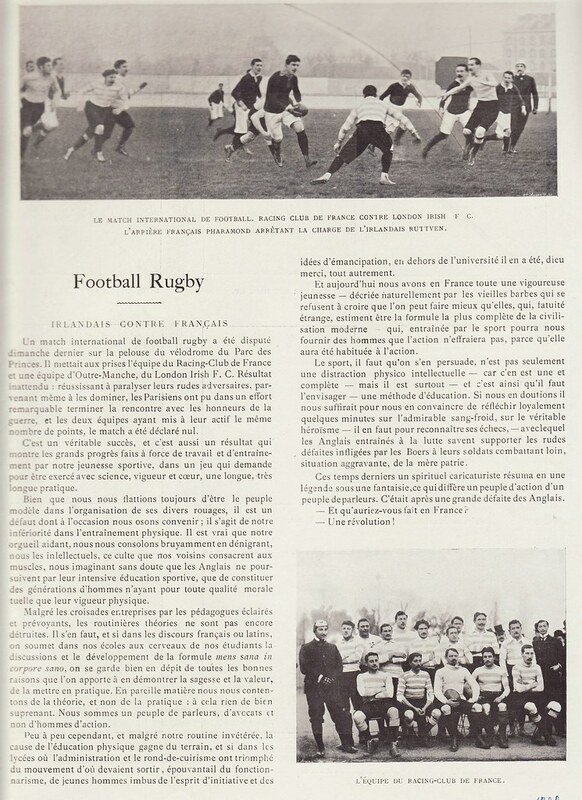 The formation of the Rugby Union of Canada took place in 1929 and this was followed by a tour of Japan by a Canadian representatives side in 1932 (W5, L2)." On the West Coast, in British Columbia (say, 4500 km away from Toronto !! 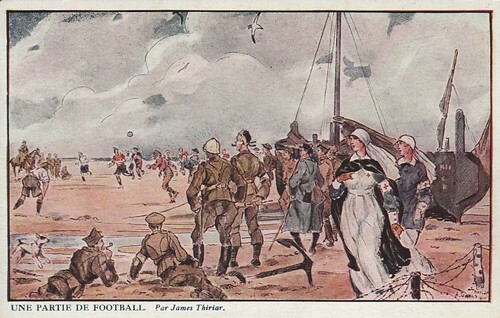 ), the first game was played in 1876 between members of the Royal Navy and the land forces on Vancouver Island. 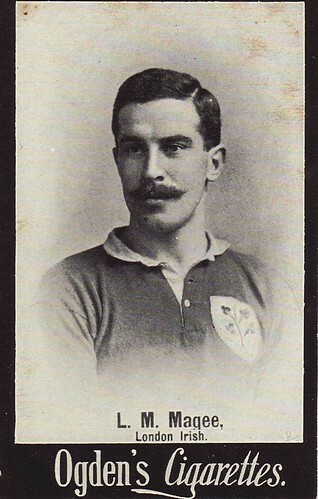 It was another ten years before the game was played on the mainland and in 1889. 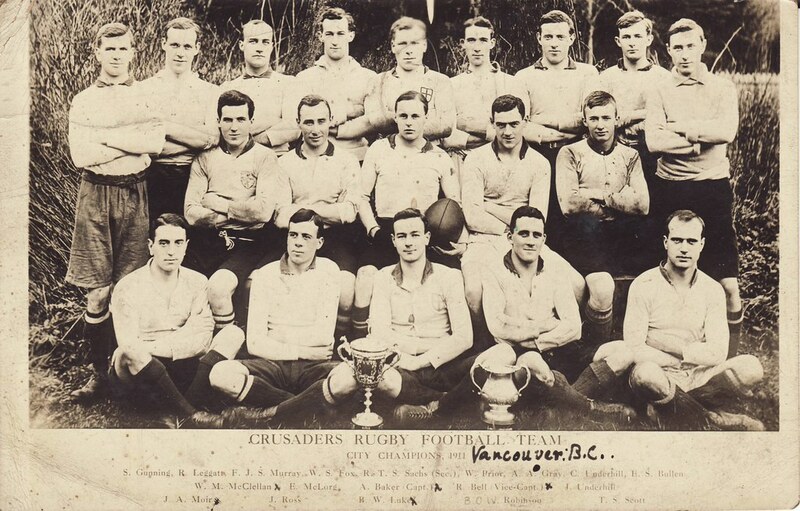 Below are Vancouver Crusaders RFC, City Champions 1911 (large pic here) - and, yes, these guys really look like ruggers! BTW : I'm looking for some pictures of the Canadian tour in Japan in 1932. Anyone around ? Here is king size picture if some Harlequins fans would like to check all the names. But that's another story ! No blogging since three months... shame ! shame ! shame ! too many projects... not enough time... but back to work now, there's a World Cup to prepare ! 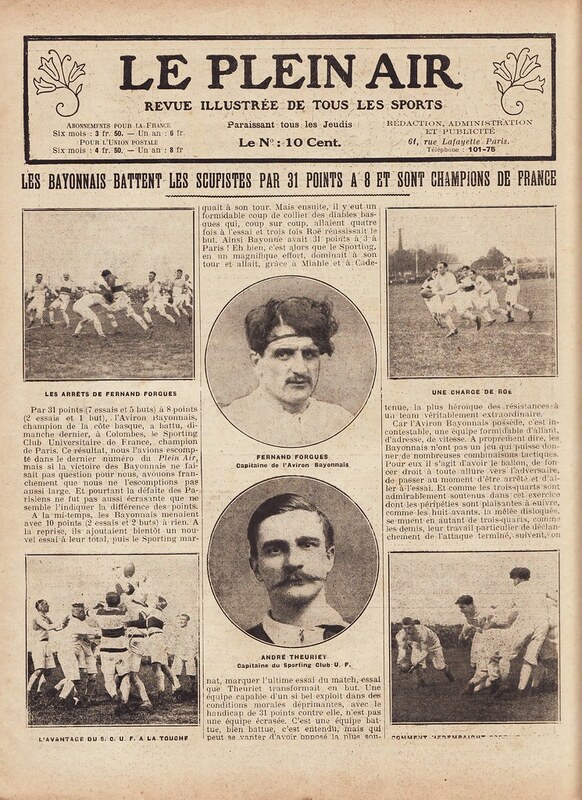 The elegant handwriting "Paris, 29 Aug. 1901" (nota : before 1903, writing on postcards was only allowed on the front of picture side) was a precious hint to identify the place as the famous Parc des Princes, and the defending team as Racing Club de France. This said : no caption, no place, no date... and no possibility to know more about it until I was lucky enough to uncover the very same photography in this 2 pages article (signed D.Ropgoal... ha ha!) 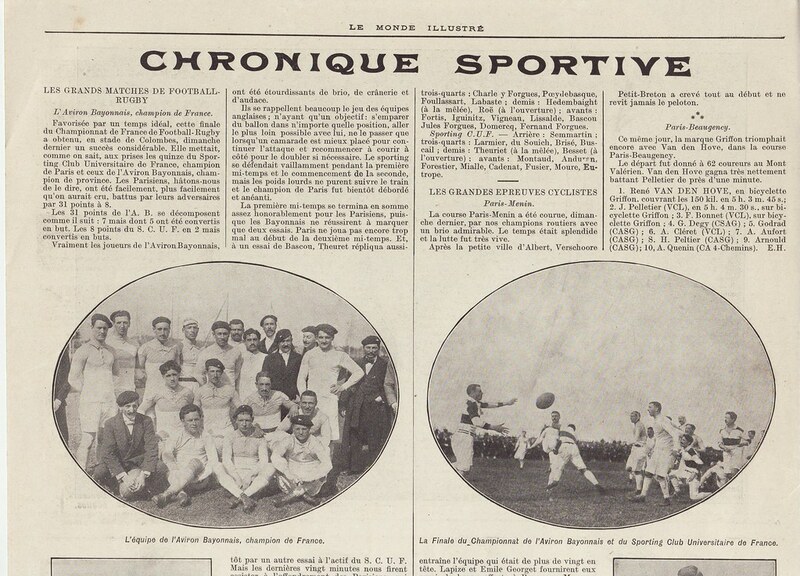 published in French sports magazine "Sports Illustrés" dated Dec.1899 (to read, in French here page 1 and 2 ). Bingo ! Happy to read that the visiting team was London Irish F.C. 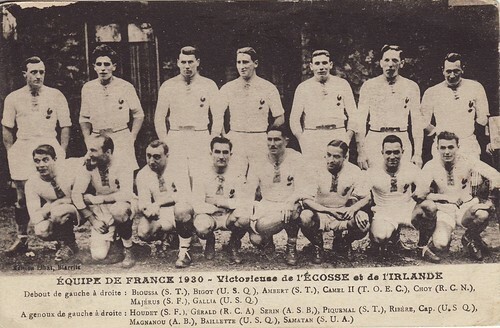 This team picture shows the French line-up before playing the Scots : standing (from l to r) Bioussa, Bigot, Ambert, Camel, Choy, Majerus, Gallia - sitting : Houdet, Gérald, Serin, Piquemal, Ribère cap, Magnanou, Baillette, Samatan. 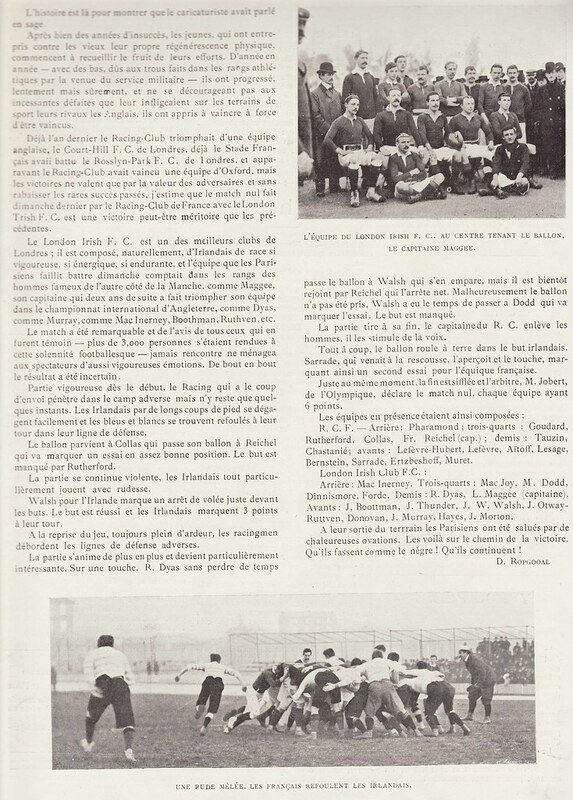 Here is one of the many photographies published by Illustrated London News after the game : French scrumhalf L.Serin scoring the first try of the game... more pictures in a fortnight after the 2011 game is played ! Pretty girl and handsome ruggers. 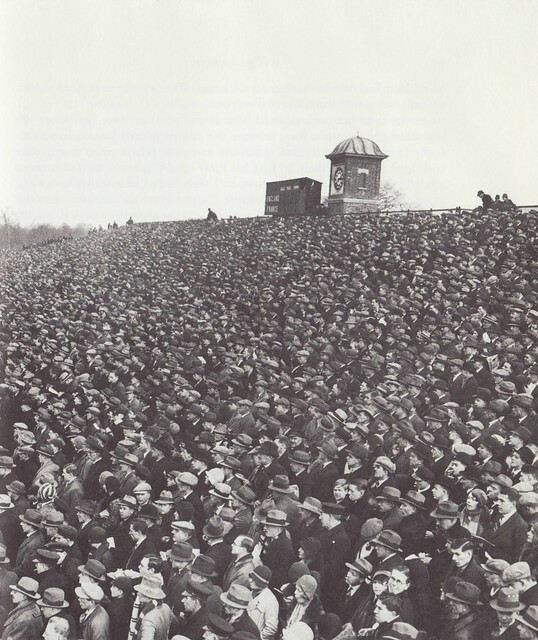 Spring 1914, the end of an era. 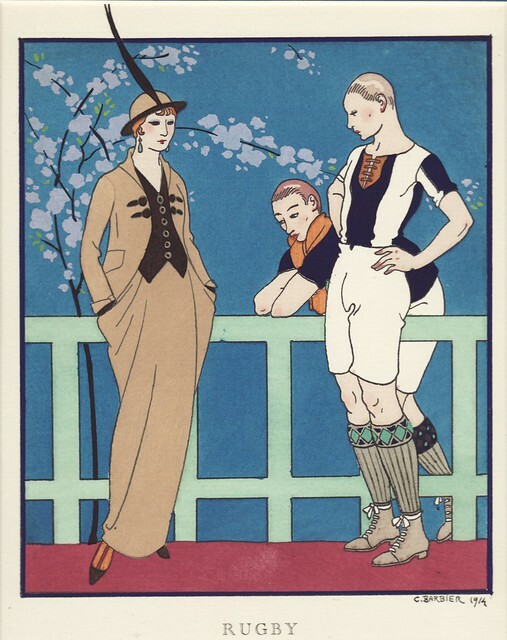 This being said, this artwork is a great hand made "art deco" pochoir by artist Georges Barbier, published in April 1914 in "Gazette du Bon ton", a French classy and elistist fashion magazine. Quoting Wikipedia "The magazine [...] was available only to subscribers and was priced at a steep 100 francs per year, or $425.61 in today's money. [...] The magazine signed exclusive contracts with seven of Paris's top couture houses so that the designers' fashions were shown only in the pages of the Gazette. 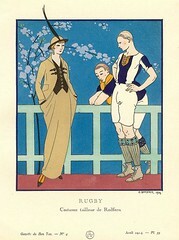 The magazine's title was derived from the French concept of bon ton, or timeless good taste and refinement"
Full caption reads "Rugby - Costume tailleur de Redfern". My two cents of fashion of "couture" history (Google is my friend...) : John Redfern from London is credited to have created the "tailor-made" - a lady's suit composed of a tailored jacket and skirt - by the middle of the XIXth Century. Later on, Redfern's couture house established branches in Paris and in the US. QED ! Only an Englishman could name his work after our favorite sport ! 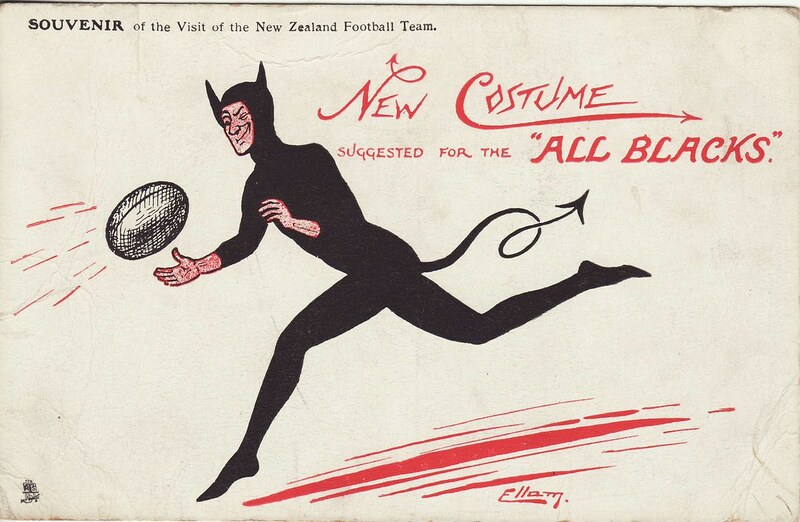 And to "close the loop" with my previous comment about WW1, you'll be happy to know that Redfern designed the first women's uniform for the Red Cross in 1916... maybe this one below ?